It’s a good sign when your grocery store starts carrying asparagus again. Not the wimpy thin variety, but the thick stalks that scream springtime. I was lucky enough to score a bunch of the stuff during this week’s grocery haul, which made me one happy camper. The end is near, people! Warm weather is nigh, and along with it comes a slew of awesome, juicy, sweet produce that you’ve been dreaming about from beneath endless layers of blankets. But I digress. Back to the asparagus. Aside from making one’s pee smell weird, it just might be one of my favorite veggies. It’s flavorful and crunchy and oh-so-versatile. You can basically slop anything on it and cook/bake/sauté/steam it any which way and it’ll still be supercalafragalisticexpialadelicious. That said, it will make your pee smell weird. Really weird. Unforgivably weird. 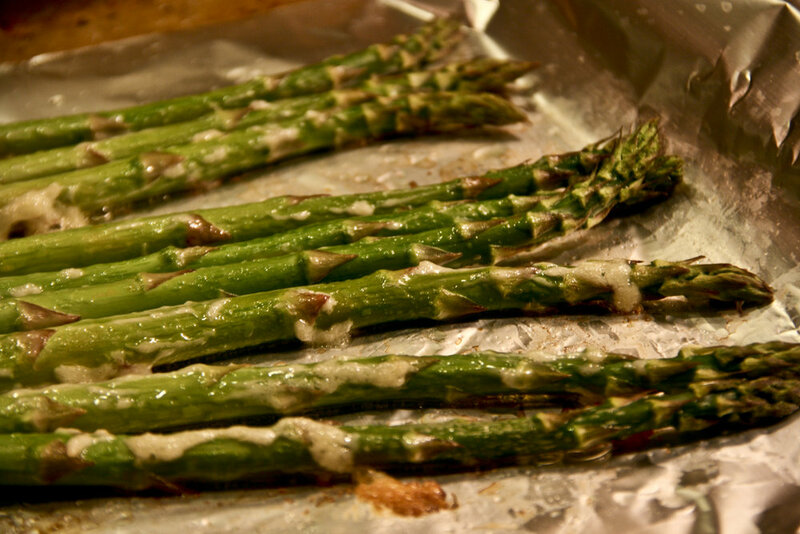 What’s not weird though, is this easy and yummy asparagus recipe. It’s baked just long enough for the spears to become tender and juicy, but not so long that they get wilted and soggy. The garlic mayo infuses the stalks with a little bite and some added richness. I always keep some of this stuff in the fridge, by the way. It’s great on sandwiches, in salad dressings, on tacos, and is probably a great addition to crostini. This dish is a great side, wonderfully complementing roasted chicken, as well as accompanying sautéed beef and tofu dishes. 1. Preheat oven to 375o and line a baking sheet with aluminum foil. 2. Combine mayonnaise and crushed garlic. Add more garlic to further embolden the flavor. Letting it sit in the fridge overnight helps as well. 3. Rinse and dry asparagus. Cut off bottom inch of stalks. (see my note) 4. 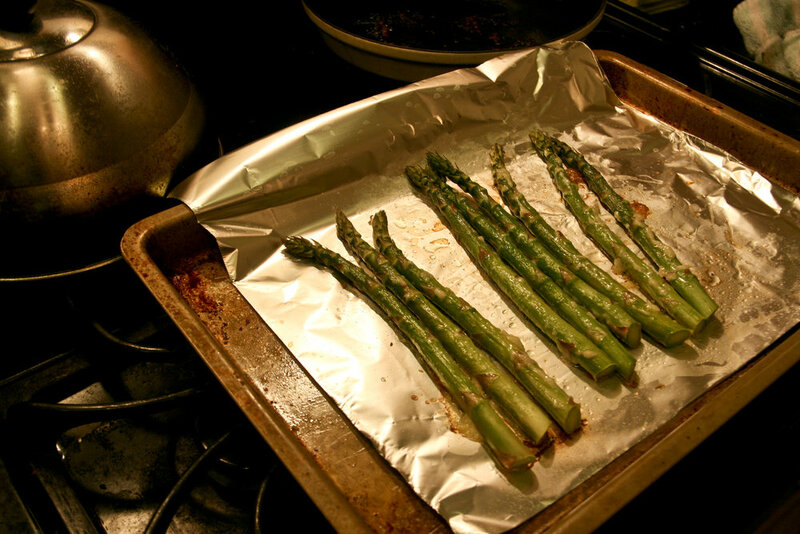 Place asparagus on baking sheet. Drizzle olive oil and lemon juice over stalks and roll to coat. 5. Using a small rubber spatula or your fingers, smear garlic mayonnaise over stalks. Sprinkle with salt. 6. Bake for 12-15 minutes, until desired tenderness is reached.